Nominating petitions for the 2019 election for the Board of Governors of The Florida Bar must be received in The Florida Bar headquarters office on or before 5 p.m., December 17. All of the board positions are for two-year terms. Executive Director Joshua E. Doyle, on October 1 certified to John A. Tomasino, clerk of the Supreme Court, the number of members of The Florida Bar in good standing in each of Florida’s 20 judicial circuits and outside the State of Florida, and the number of circuit representatives based on the apportionment formula set forth in Rule 2-3.3, Rules Regulating The Florida Bar. Pursuant to Rule 2-3.4(b), incumbent board members must advise the executive director of their intention to seek reelection to a new term. The board members who do not plan to run again are indicated by an asterisk next to their names. Nominating petitions for the Board of Governors must be signed by no fewer than five members in good standing whose official Bar address is in the same judicial circuit (or out-of-state, if applicable) as the nominee (see form below). Election ballots will be emailed or mailed on or before March 1, and voted ballots must be received prior to midnight EST, March 21. 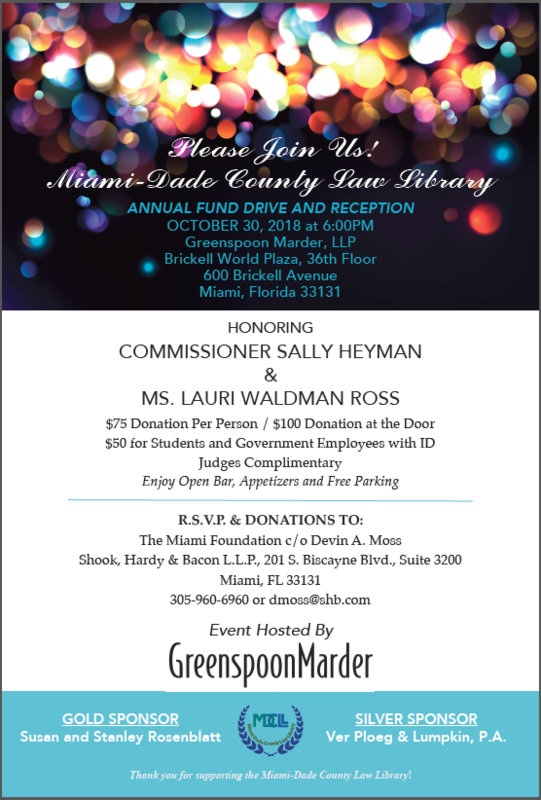 Donations may be made directly to the PayPal account at: http://www.mdcll.org/events.html. Thank you! 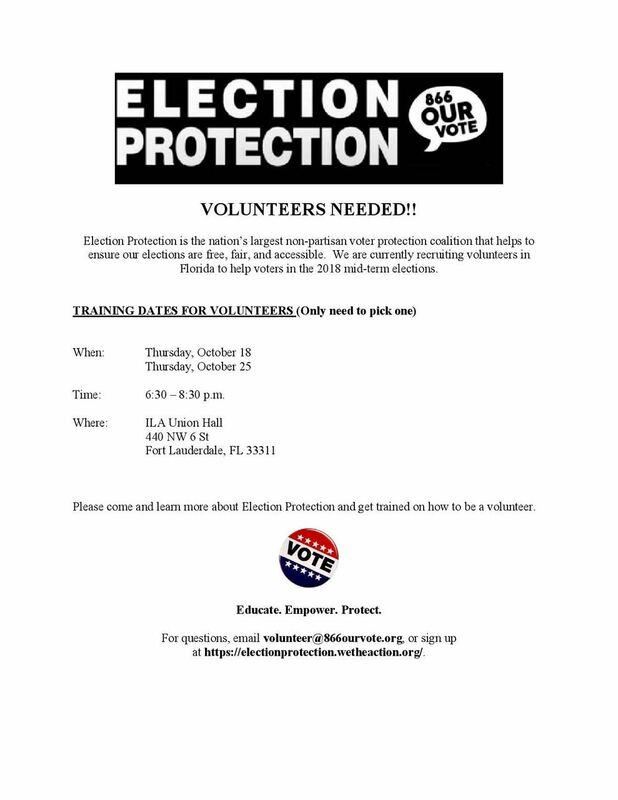 For questions, email volunteer@866ourvote.org, or sign up at https://electionprotection.wetheaction.org/. 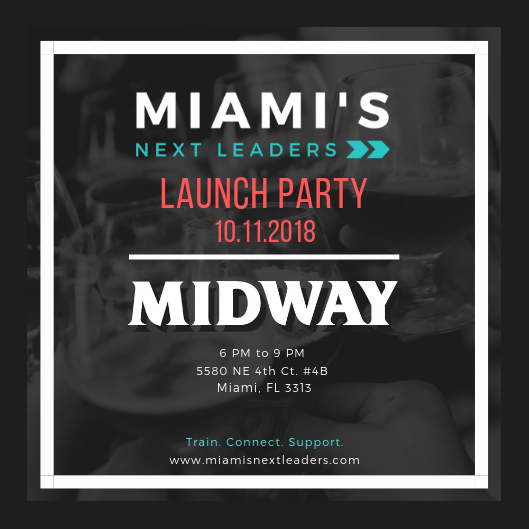 As women leaders in Miami, we are shocked at the present discourse by some of our elected officials, the blatant mockery and disrespect of women, and in particular of Dr. Ford. It is at these moments that all women in our community must act together. We must raise our voices and be LOUD in the most important and effective way with our vote at the ballot box this November 6th. Please check your voting status to be sure you are an active voter to participate in this election. Do not assume that you are - take the minute to verify that you are registered. You can Register to Vote or Update Your Information and check that all your voting details are correct by Tuesday, October 9. Do not delay! Make a voting plan - the ballot is very long with 12 State Constitution amendments, 5 County Charter amendments, School Board Referendum, candidates and more. Be an informed voter. Learn about the candidates and the amendments at https://www.vote411.org/. Make your selections and print your personalized ballot. Share this message with your sisters, daughters, mother, grandmothers, and friends. Take 5 women with you to vote! Our vote is our voice and that is our power! Lastly, but most importantly, I must address those brave individuals — male and female — who have survived sexual assault or abuse. We stand with you. We believe you. Please practice self care, because the pain of watching the news this week can trigger the past and be emotionally damaging. Seek professional counseling if you need it. The Florida Bar has resources; if you attended the WLOC Summit, one of our presenters, Dr. Delvena Thomas, specializes in emotional trauma. The takeaway for me is that more women need to run for office - especially the Senate - to end the chokehold of the old boys club. We have miles to go on the topic of sexual assault in America. But nothing is impossible - every journey starts with a single step. MIAMI – The Eleventh Circuit Judicial Nominating Commission has been asked to provide Governor Rick Scott with nominees for the vacancy in the Miami-Dade Circuit Court created by the resignation of Circuit Court Judge Ariana Fajardo Orshan. (2): The original unredacted application shall be emailed in .pdf format to: hayden.obyrne@klgates.com. (3): A redacted .pdf of the application shall be emailed to eleventhcircuitjnc@klgates.com. Personal information not subject to public disclosure—such as the social security number—shall be redacted as permitted by Section 119.071 of the Florida Statutes. Applications may be downloaded from The Florida Bar’s website at www.floridabar.org and the Office of the Governor at www.flgov.com. Applicants should include a recent photograph. TALLAHASSEE, [September 12, 2018] — The Florida Supreme Court Judicial Nominating Commission is accepting applications to fill three positions of Florida Supreme Court Justice, appointed by the Governor, upon the mandatory retirement of Justices Barbara Pariente, R. Fred Lewis, and Peggy Quince. 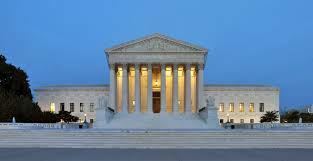 Based on the Supreme Court’s current composition, one seat must be filled by a qualified applicant who resides in the Third Appellate District; the other two seats are at-large. Applications may be obtained from https://www.floridabar.org/directories/jnc/applications/. Applicants must submit (1) an original application (including all attachments); (2) an electronic copy of the original application (including all attachments) in pdf format; and (3) an electronic redacted copy of the original application, which excludes all material that is exempt or confidential under applicable public records laws. The original signed, unredacted paper application must be provided to JNC Chair Jason L. Unger, GrayRobinson, 301 S. Bronough St., Ste. 600, Tallahassee 32301-1724 no later than 5:00 p.m. on October 8, 2018. Additionally, an unredacted copy of the original application (including all attachments) and a redacted copy must be e-mailed, in pdf format, to all Commission members by the same date and time. Applicants who are selected by the Commission for personal interviews will be informed of their interview times by e-mail. Florida Judicial Qualifications Commission: Two attorneys to serve six-year terms commencing on January 1, 2019 and expiring December 31, 2024. The 15-member commission is authorized under Article V, Section 12, Florida Constitution, to investigate complaints against judges whose conduct demonstrates a present unfitness to hold office and recommends disciplinary action to the Supreme Court. No member of the commission, except a judge, shall be eligible for state judicial office while acting as a member of the commission and for a period of two years thereafter. No member of the commission shall hold office in a political party or participate in any campaign for judicial office or hold public office; provided that a judge may campaign for judicial office and hold that office. Persons interested in applying for this vacancy may click here to download the Application for Special Appointment or should call Bar headquarters at (850) 561-5667, to obtain the application form. Completed applications must be received by the Executive Director, The Florida Bar, 651 East Jefferson Street, Tallahassee, Florida, 32399-2300 or submitted via e-mail to specialapptapp@floridabar.org no later than the close of business on Friday, October 19, 2018. Resumes will not be accepted in lieu of the required application. The Board of Governors will review all applications and may request telephone or personal interviews. 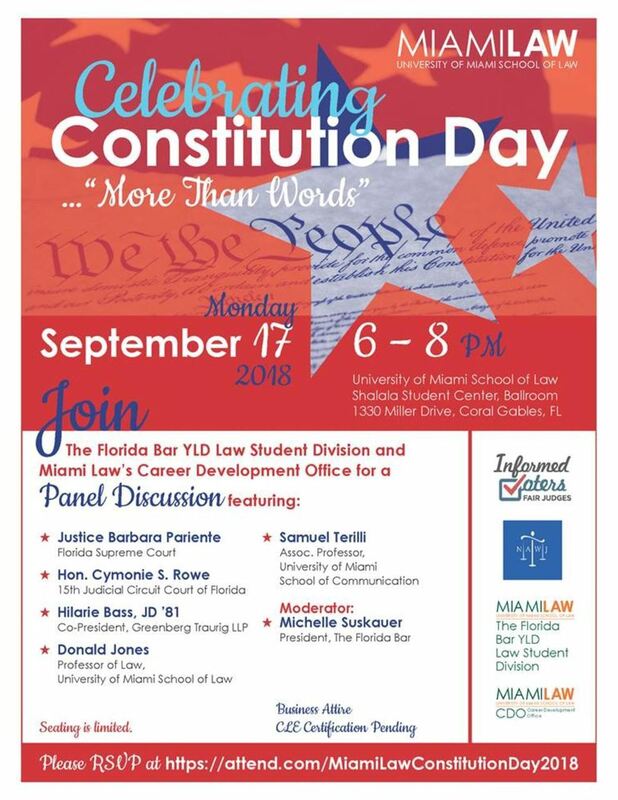 Celebrate Constitution Day at Miami Law with Justice Pariente, Judge Rowe, Michelle Suskauer and more! Approved for 2.5 CLE Credits (General and State and Federal Government and Administrative Practice)!